We have an excellent provision for Table Tennis in the spacious and well lit Scout Hall with room for 6 tables in action at once. Table tennis takes place on Fridays with the U3A club 10am to 12 noon and Tuesdays (GP) and Fridays (All Welcome) 14:00 – 16:00 for adults. The “Tropics” Junior Club runs on Fridays 18:00 – 19:30 (including school holidays). The “Tropics” is a junior session for anyone, including disabilities, females/males and ages is for juniors aged between 7-17 years. Come and give it a try! Only £2.00 per player/per session. LETS GET TROPICAL SiD Tropics Table Tennis Club. 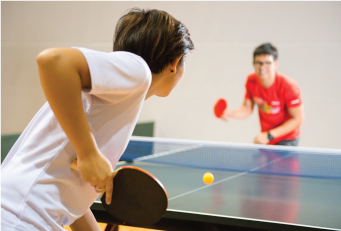 The club is up and running; if you want high octane table tennis drills, shots, serves and airborne smashes then join Tropics for table tennis every Friday between 6 and 7.30pm. Everyone welcome if you’re under age 16, for fun games and practice matches £2 each. So channel your inner Desmond Douglas and lets get Tropical! Open sessions on Fridays 2pm to 4pm, Currently free, so bring a friend and give it a try! 6 tables available in the Scout Hall.